Not so long ago I tested the Acer Travelmate 621XC and it was clear that an Intel® Pentium® 4-Ì in the same box should be expected soon. Well, this is what we have today in our lab. 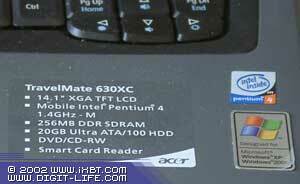 According to Acer, TravelMate 620 are mobile PCs of the business class with extended functional capabilities. They are meant for users who need high mobility together with high performance. Well, it's not much time that passed, no new designs were invented, and the Acer's one was always brilliant. 256MB DDR-266 SDRAM; expendable to 1024MB (the tested model has 256 MB). Ultra ATA/100 hard drive with DASP system, from 20GB (the tested sample comes with Toshiba MK2018GAP 20 GB). 8x DVD-ROM or DVD-ROM/CD-RW drive (the tested sample has Matsushita UJDA720 DVD/CD-RW), integrated into the notebook (AcerMedia bay). So, they have replaced the chipset, processor and video card. The processor is not the fastest (the Toshiba Satellite 5105-s501, for example, has it clocked at 1.7 GHz), and it's the first time I see a chipset from ALi for the Ð4. The run-down time is less this time. Now, if you have read the previous review on the Acer's notebook you can take a look at the beginning of the "first impressions & ergonomics" section and then go directly to the tests. If you doubt that I hold this models in my hands at all - here is a photo. Recovery packet in 5 CDs - boot disc with drivers for Windows XP, e-version of the user manual and Help, and two recovery discs for Windows XP Home Edition - in two languages. CD with Nti CD-Maker Plus Edition. Well, the front panel traditionally incorporates an IR port and speakers. The display panel have connectors for a camera which are hidden under the covers on the left and right. The right panel, like the left one, is not overloaded - it contains a Kensington lock, power button (! ), air vent and AcerMedia Bay. As you might remember the previous sample had problems with its screen frame. Well, this one doesn't have any. Fir the first time I was looking for the power button quite long as I got used to the fact that it's located on the keyboard. But it's not a disadvantage. Well, it asks to insert a Smart card. It's the right time to show how information is protected in the notebook. The preinstalled software includes PlatinumPAS(TM), PlatinumSecure(TM) and PlatinumKey(TM). The PlatinumPAS protects data on the BIOS level. During the POST procedure the program checks whether a main or emergency Smart card is inserted, and if it doesn't find it the booting process stops. The PlatinumSecure extends capabilities of the authentication procedure on the OS level using cryptographic methods. When the card is ejected this program starts up the screensaver and locks the system. The emergency Smart card is necessary to enter the system and disable the protection if a main card is lacking. Besides, the utility allows for encryption of files. The PlatinumKey provides auto user authentication on sites which require passwords. All those things can be disabled. When we inserted the card the computer booted up successfully. The keyboard is very handy. I was never disposed toward TouchPads because you have to move your hands down to position the pointer or press mouse buttons. And here thumbs are right above the pointer management system, and you don't need to raise the base of the palm above the keyboard. The TouchPad of the TravelMate 620 series differs from that of the TravelMate 610. The swing scroller is replaced with a disc which has some more functions (like back-next in the browser). I don't know how useful these functions are, but the touchpad itself helps a lot. There are no more complains about its operation. Now let's turn to such function as Recovery. This process is implemented ideally in the Acer notebooks. You boot from the system CD-ROM and choose what you need to do. There are the following ways. You can set it back to the initial state - this option is very useful for resellers as all user information get lost - an image created by the Norton Ghost program is written on the disc. Reinstall applications - this is a useful function if you have deleted a program and then understand you can't do without it. At last, driver installation - this is for advanced users who work with discs partitioned to their liking. Warranty. The warranty period for the Acer notebooks is 1 year. Service. Any of authorized service centers (the list is available on the site) can implement diagnostics of a notebook and, in certain case, repair. But to be repaired a computer gets into the central service center, if the warranty is valid. If not, any Acer's service center can repair it on the spot. Site. The design is comprehensive, the descriptions of models are detailed and illustrated, supplemented with a demo program etc. There is a base of drivers and BIOS updates. The hot-line support was checked when we tested the TravelMate350 model. Well, it does work. During the warranty period any modernization must be undertaken in an authorized service center. When it finishes you can expand memory (unscrew the cover on the bottom) and replace a hard drive (unscrew a respective bolt and take out a hard drive unit). But a processor should be replaced by experts from a service center. "-1" - lack of user manuals and description of accessories on some sites in other languages. This time I used one more benchmark - BAPCo/MadOnion MobileMark 2002. 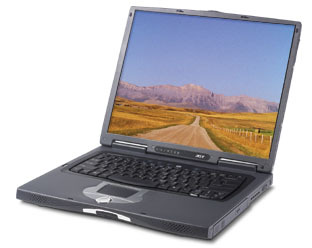 It works under the Microsoft Windows XP (Professional and Home) or Windows 2000 Professional in two modes. The first one measures performance of the notebook together with the run-down time (comparison of performance levels of the tested sample with the reference one, and average time of implementation of operations). The application suite almost coicides with the SysMark 2002. It also emulates pauses in operation of the notebook. 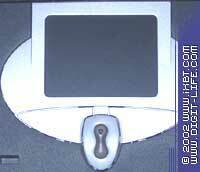 The second mode measures only the run-down time when reading e-books in the Netscape Communicator 6.0 . It was "War and Peace" in English (!!!). The scrolling speed allows for easy reading. For more details on the test go to the BAPCo's site. Well, as for the graphics results the situation is clear - an integrated controller and GeForce2Go are different things. And the disc subsystem doesn't shine. I think it's the chipset to blame. That is why the scores of the ZD Content Creation Winstone 2002 and SysMark 2002 Office Productivity are so close. The advantage of the new model in the MadOnion 3DMark 2001 is unquestionable. That is why I will omit the results of its predecessor. Finally, the Rage Games Expendable. Quite unexpectedly... I think it's because the test is not the latest, and 16 MB of video memory is not enough. Well, this computer wasn't developed for games. Subjective estimation - 98 scores. I'm very fond of the design of the Acer's notebooks! That is why the estimation is subjective :). All in all, this is a good business machine. Though I'd take the TravelMate 621XC, just to save money. But Acer keeps on reducing prices little by little.